Please fill out this form and wait for it to be accepted before Roleplaying and taking part in the pack. 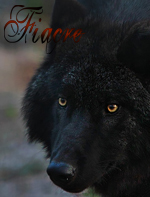 Personality: Fiacre is a withdrawn wolf. She has lead a long life of solitude evolving her personality into becoming an anti-social wolf with no urge to socialize unless it is with those she holds close. Rarely is the friendly side to the cold fae seen, and she often keeps the icy walls up, unwilling to place trust in those she meets. As cold as she may appear, the onyx wolf is fairly observant, she prefers to watch and judge before making a decision over a wolf. Accepted, welcome to the pack, Fiacre! Eye Color: Left eye blue, right eye brown. Personality: Stormy..... full of vigour and is very dominant, but makes many friends, which isn't very surprising, seeing that she's a pup... Loves thunderstorms, blizzards, and any other kind of storm. Her previous pack fell apart, and her mother was killed by a hunter. How did you find us: Sokea!